I know this is our Fun-Filled Friday post, but I have to admit that most of today isn't going to be all that much fun. But, this weekend should be very enjoyable! We have some very special guests arriving tomorrow for a SUPER SPECIAL evening tomorrow night! 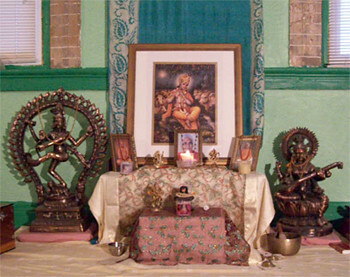 Leela Mata, a beautiful spiritual teacher, has offered to visit my home and hold Satsang here. One of her extremely talented students, Devaki, will be joining her (and bringing a harmonium to play at Satsang!). If you are in the Pittsburgh area, or close enough to come in for a visit, you are more than welcome to join us! Just let me know before the end of this evening, so that we can make sure to have enough food for dinner. ;-)? Satsang is a very special time of meditation, chanting, and a discourse presented by a spiritual teacher. I've always been inspired by Mata Ji's talks--taking away something special and meaningful for myself every time. She has a way of talking where everyone feels she's giving them each, individually, a message that will help them be more of who they are meant to be in this life. Today, however, I'll be cleaning. The house is mostly tidy, but it's in dire need of a thorough cleaning. So, that's what KDcat and I will be doing while Jim is at work all day. This evening we head out to Julia's puppy training class, where she can play with her brother Griffin, again!